The instrument is made of a round copper plate with, on one side, two volvelles with brass arm and on the other an alidade with another brass arm. The suspension ring is passed through a loop of metal riveted to the bracket. The upper volvelle is pierced to see the lunar phases and carries two other small gilt volvelles engraved one with a moon face and the plate around it divided into 19 parts, the other with a sun face and the plate around engraved with dominical letters. The copper volvelle itself is engraved with two shields, one bearing a three-flowered thistle, the other a merchant's mark. On the brass arm are engraved the Moon and Scorpion. 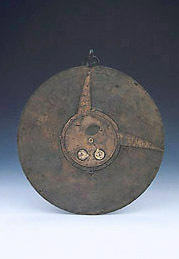 The other copper volvelle below the first one has four pointers at right angles, one of which reaches the border of the instrument and is engraved with two stars, the Sun and Lion. The volvelle is divided in equal parts, numbered 1 to 10 with further divisions to 1/4. The base plate is divided in 11 concentric circles. The outer one is divided into 365 for the days of the year, grouped in 30 or 31 for the months and has dominical letters opposite some days. Proceeding towards the centre, the following three have numerical tables for astronomical calculations. There are 19 or 20 rows of figures to each month. The fifth circle has the names of the months engraved in Gothic script and the 18th and last day of the month marked except for May where the 12th, 24th and 31st are marked. The following circle has engraved the names of 67 feasts. The seventh circle bears the names of the signs of the zodiac divided in 30, marked at each 10, with further divisions to 1, and the next circle has the figure of the relative constellations with the inscription 'Dom' and the name of the corresponding astrological house. The two innermost circles are divided into 12 parts, and numbered from 4 to 8 on each verse, with two Maltese crosses, one filled and one not, diametrically opposite. Three stars are engraved between each figure. The back of the instrument has an alidade with two sights in line with the fiducial line and a sliding gilt pointer on a third arm. The arm is engraved with an unequal scale from 10 to 60 marked each 10 with further divisions each 2. The rim of the plate is divided into 360, numbered as hours 1 to 6 on the upper right quadrant, and 4 to 12 on the left half of the instrument, starting from the point of suspension. The middle third of the upper part of the instrument is engraved as Regiomontanus-type sundial, with an unequal scale of latitudes  to 60 by 10. On the sides are two vertical scales marked 5 to 60 by 10 with further divisions to 2, and the two external scales marked 8, 14, 20 on the right hand one and 18, 24, 30, 38 on the left hand one. In connection with the dial is a scale of months on the top of the dial, a zodiac scale on the left margin and a similar scale on the right margin, though left blank. The ecliptic is engraved with 'linea eclipt', 'via solis', 'via solis lunae eclipt' and with the names of the signs of the zodiac. On the lower left quadrant is also a small shadow square marked  to 12 by 3. On the lower right quadrant are engraved the unequal hour lines, though not marked. See R. T. Gunther, Early Science in Oxford, (14 vols, Oxford, 1923-45), vol 2.